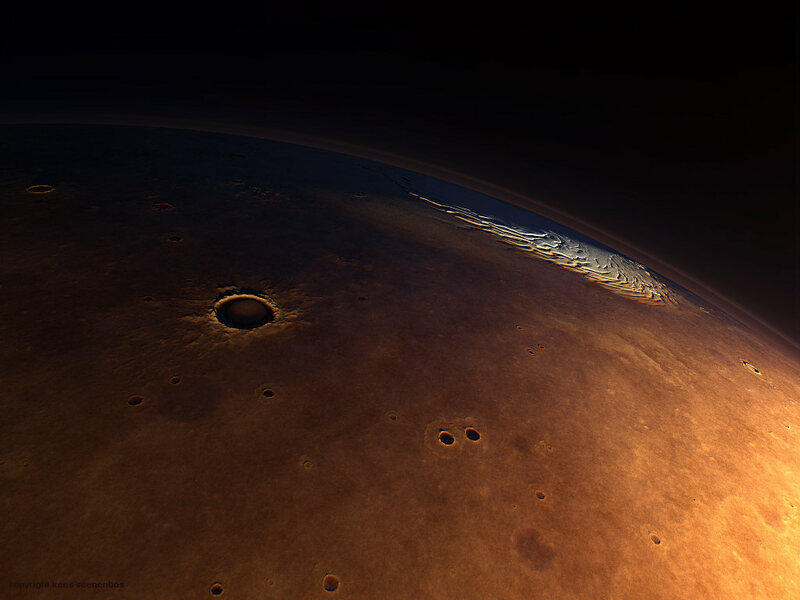 Arsia Mons rises over 20 km above the surrounding plains, is 450 km and the caldera over 120 km in diameter. See JPL Photojournal. 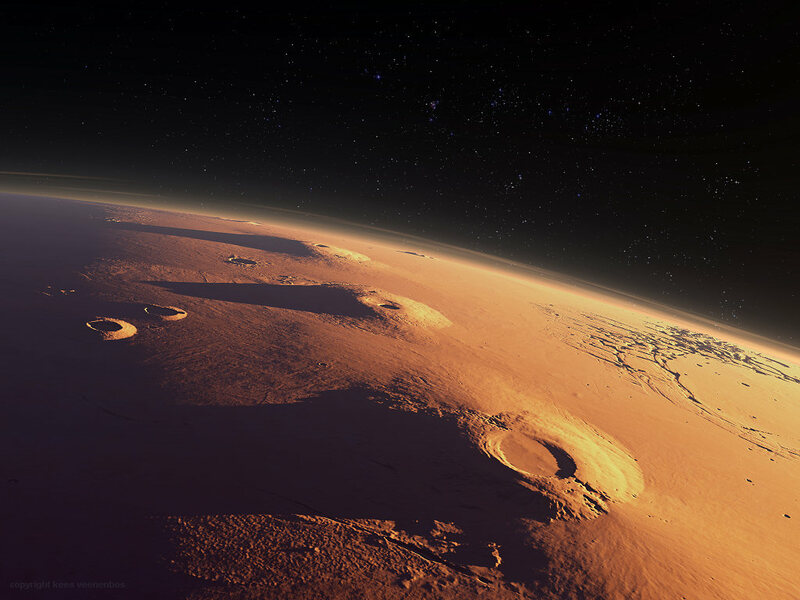 An image made for the Madrid Planetarium exhibition about Mars. At left the Hecates Tholus and at the right the Albor Thorus. With a low sun the light even doesn't reach the western ridge. The Schiaparelli Crater is 450 kilometers (280 miles) in diameter. 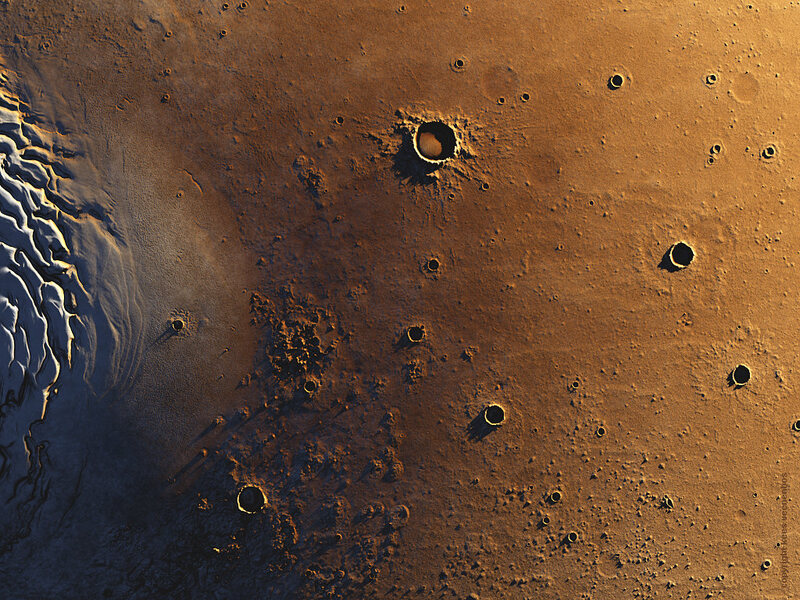 Arsia Mons, Pavonis Mons and Ascraeus Mons. View is southwest to northeast. At the left Biblis Patera (left) and Ulysses Patera. 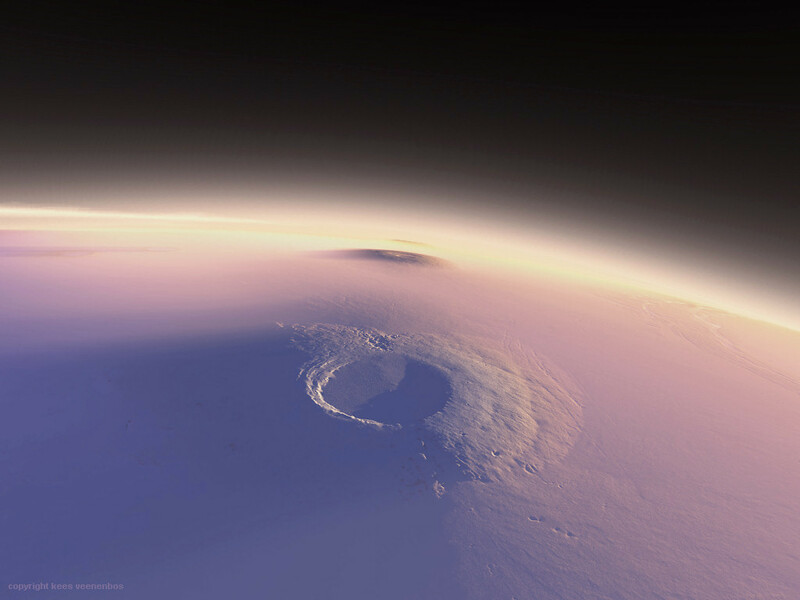 This rendering shows a few small valleys near the ridge, outlets formed by water streaming from the higher grounds into the large crater. 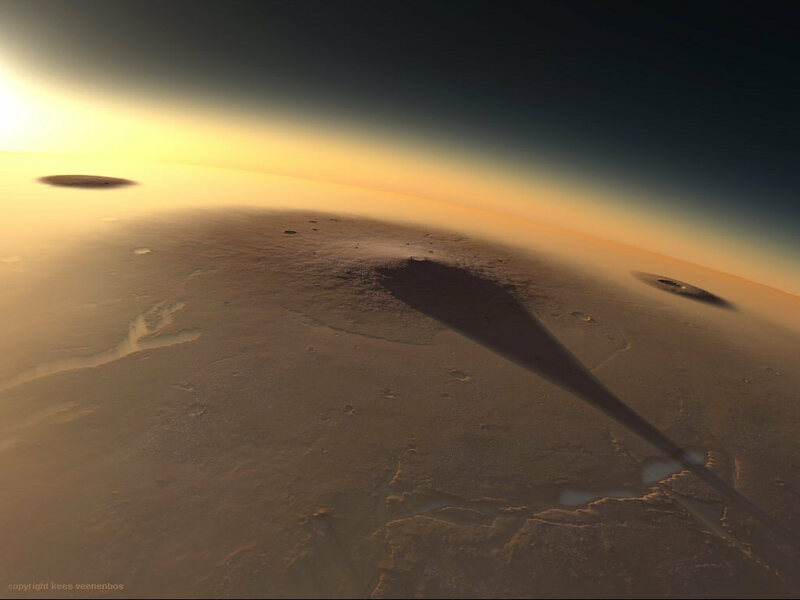 Olympus Mons some 4 billion years ago. 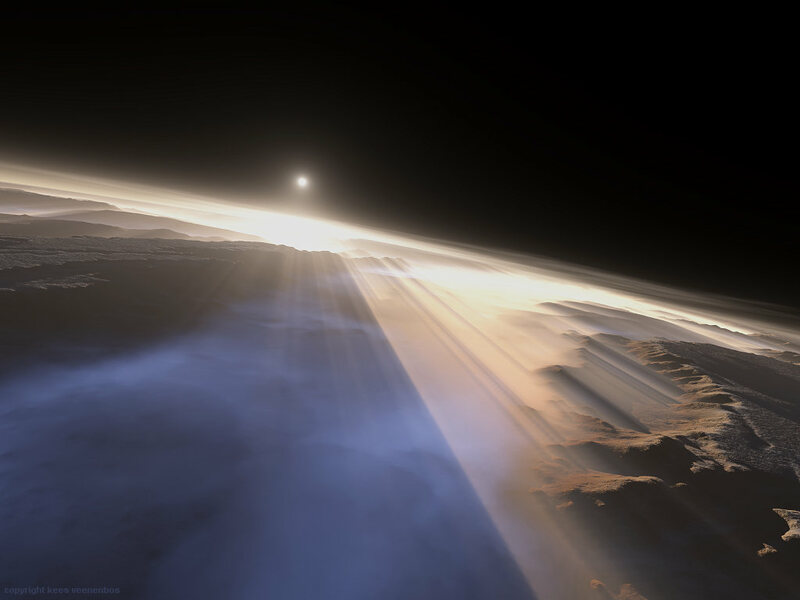 With water and a denser atmosphere. Made for a Madrid Planetarium exhibition. 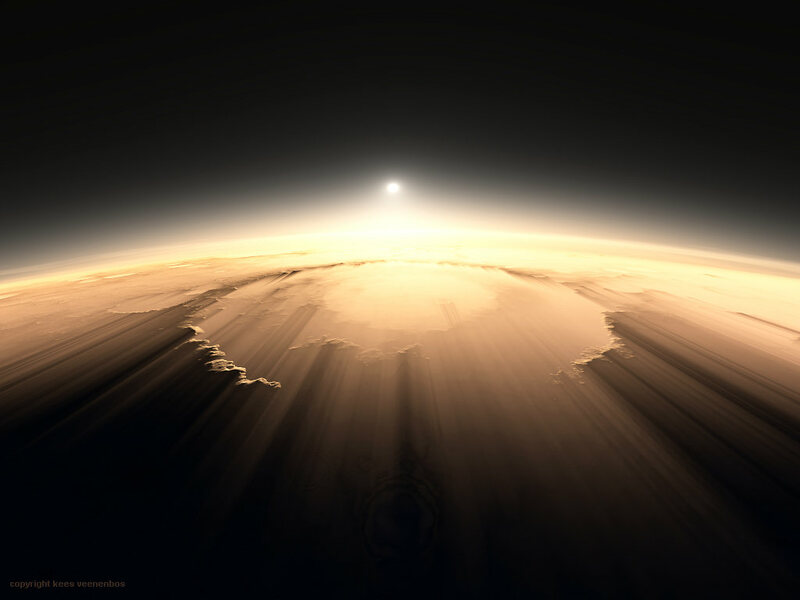 The Schiaparelli Crater at sunrise. 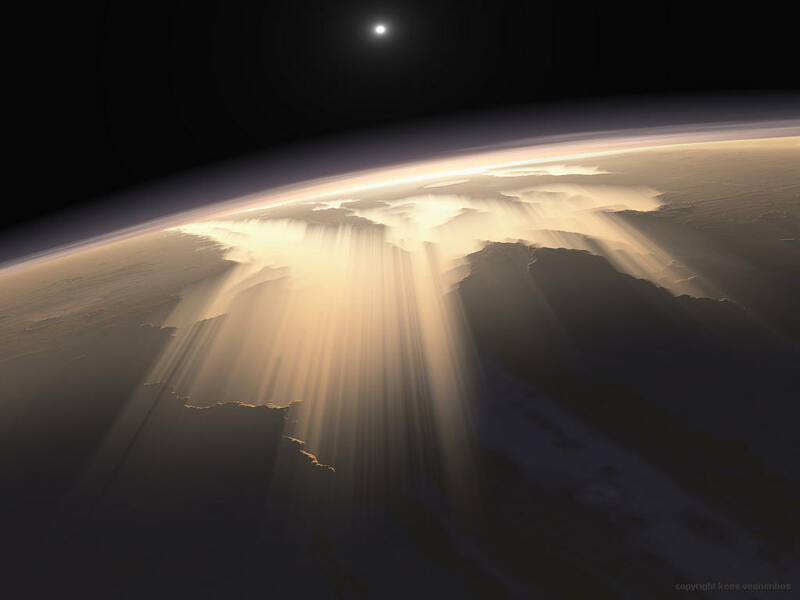 After a dust storm sun streaks are visible in the dusty atmosphere.. The Northpole (left) and the the Vastitas Borealis. The large crater at the top is the Korolev Crater 85 km (53 mi) in diameter. A photo of the Viking Orbiter is a famous one. 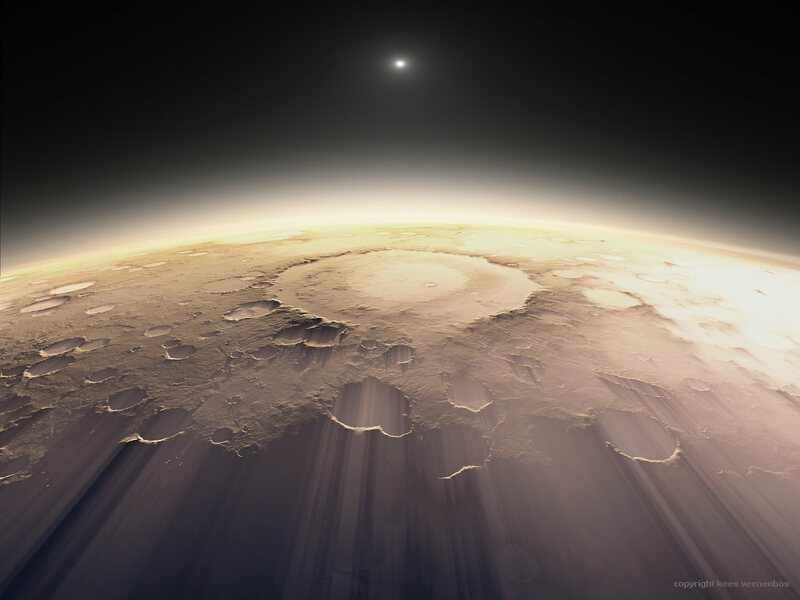 (Also called The Happy Face Crater) and this is also one of the photo's of Mars which for the first time clearly showed an atmosphere. At left one of the larger craters that have a name: the Korolev Crater (about 85 km (53 mi) in diameter ). 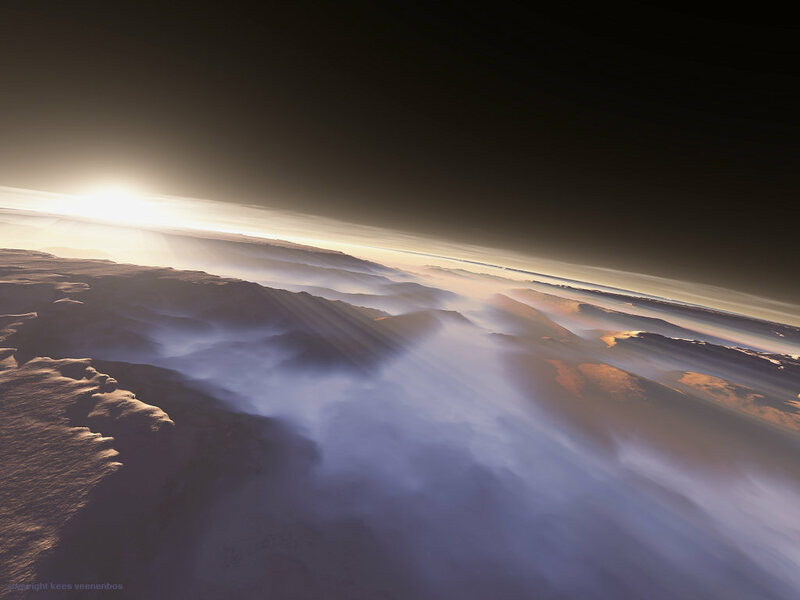 View on the ridge of the Deuteronilus Mensae in a dust storm. The lower part behind the ridge (and the crater in the middle) is the lower Vastitas Bolearis. 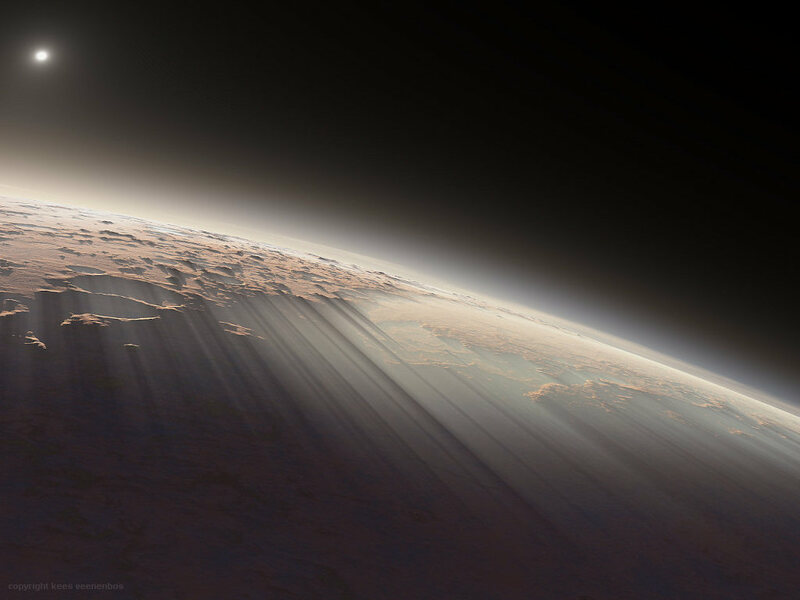 A view of the Alba Patera (1600km across) from south to the north in the aftermath of a dust storm. The Caldera is at the horizon. Some haze in the crater lightens up. At the horizon the Deuteronilus Mensae. The Lyot Crater is 236 km (~147 mi.) in diameter. An overhead view of the Alba Patera. Made for an expo of the Madrid Planetarium. At the left the caldera. Left is north and right is south. Hellas Planitia northern ridge.. The lower terrain is the depression which goes to about 6km depth. View from west to east. 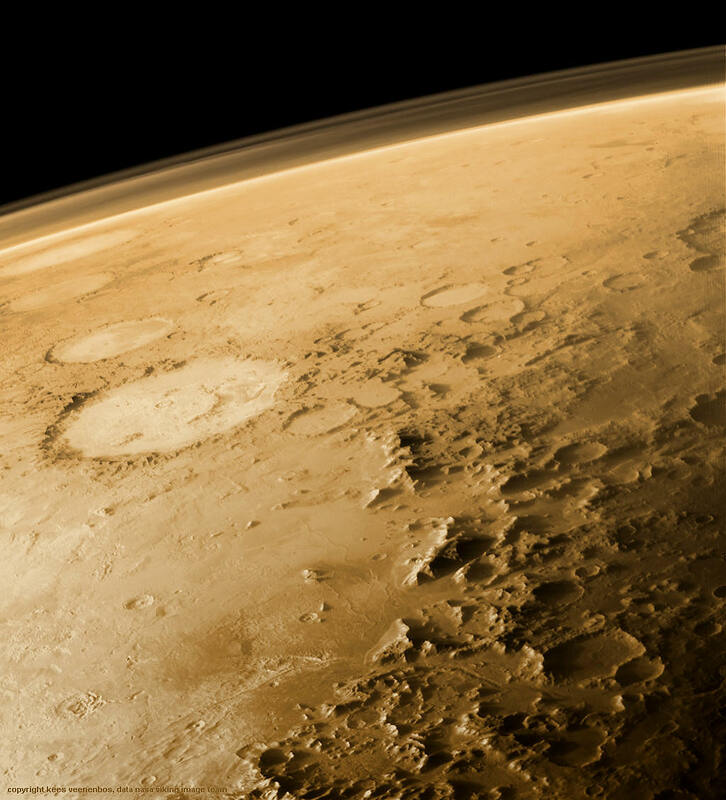 This image was printed together with the Noachian Mars image (below) for the July 2005 issue of National Geographic Magazine. 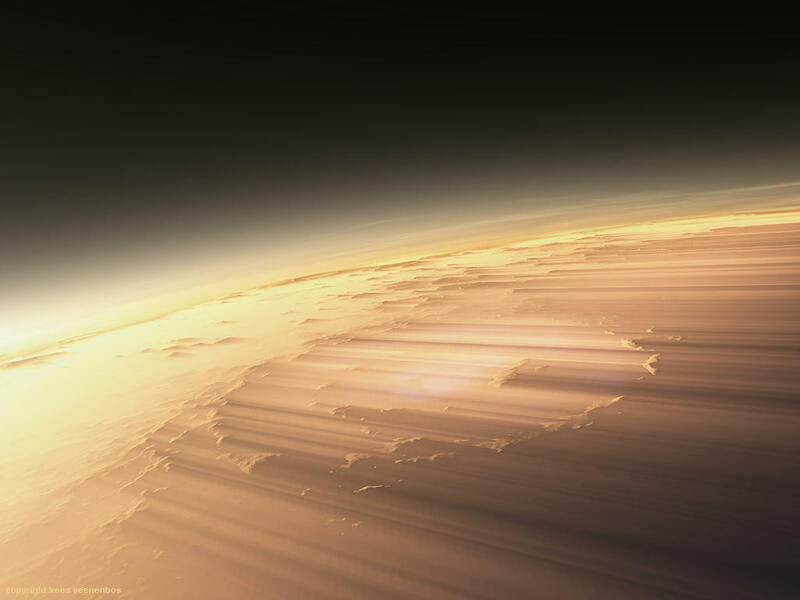 The Valles Marineris in the aftermath of a dust storm as seen from the Coprates Chasma (in front). 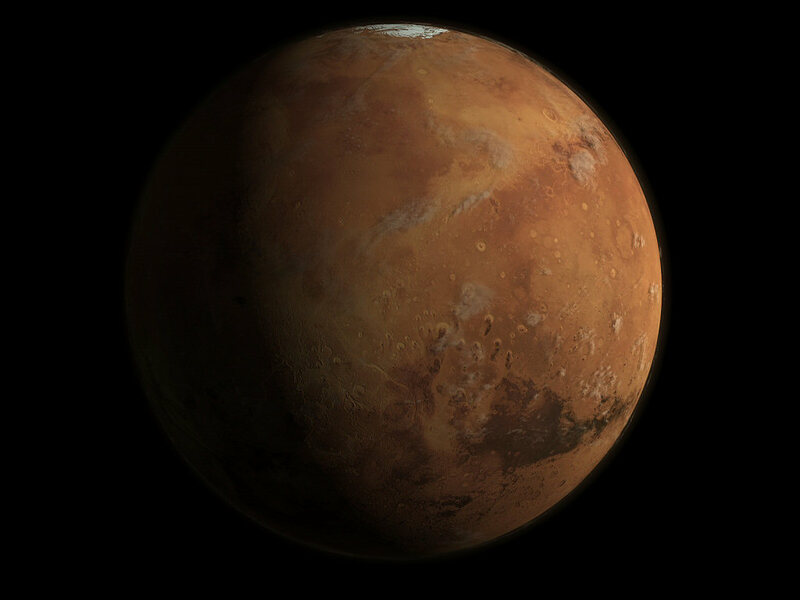 Mars about 4 billion years ago. 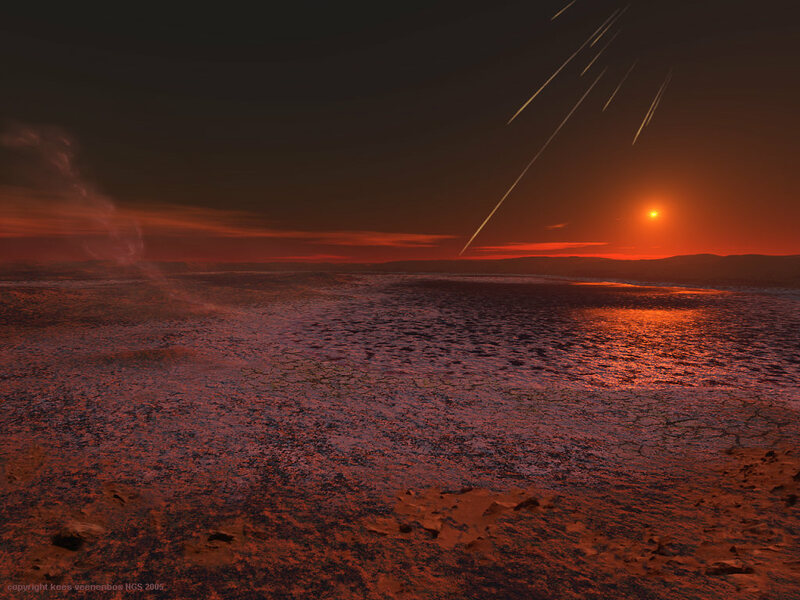 The Vastitas Bolearis filled with water, the large lake at the bottom right is the Meridiani. 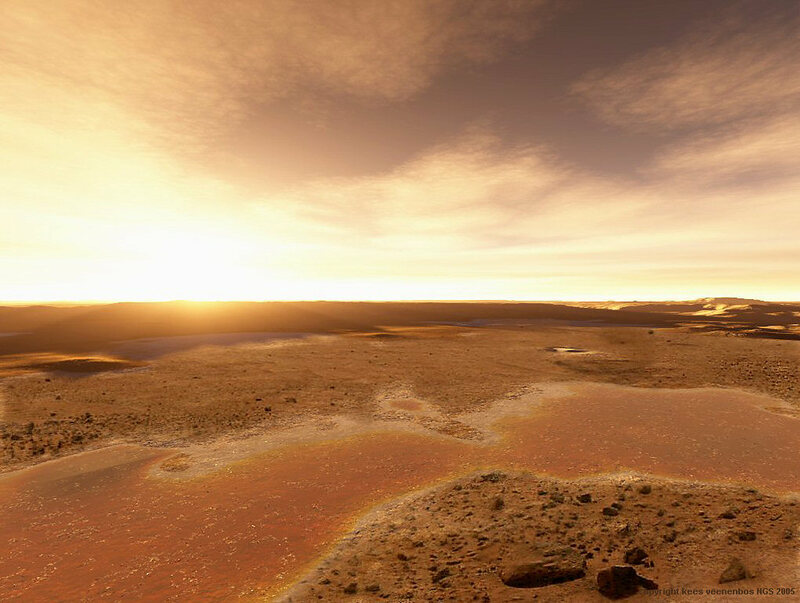 The Opportunity Rover found evidence of such an inner sea. Made for National Geo. July 2005 issue. View from the Ophir Chasma to Candor Chasma (left) and Melas Chasma (top). 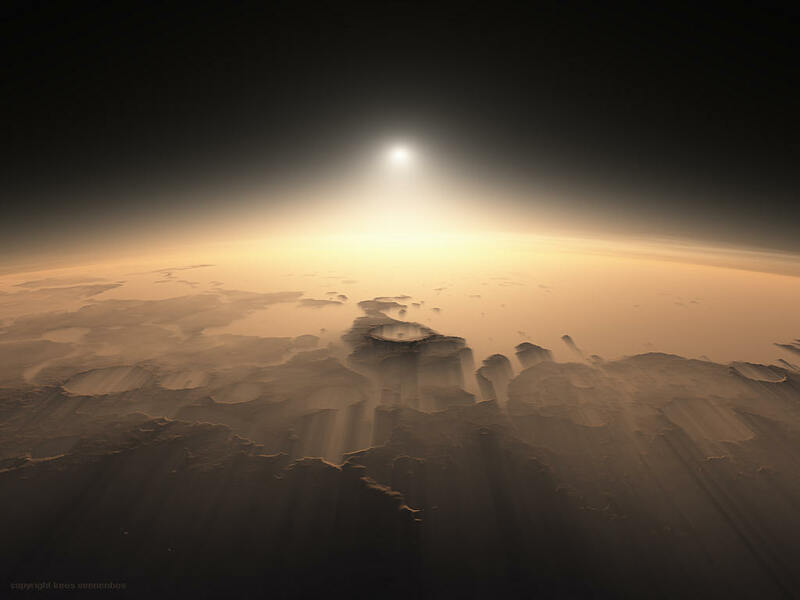 Haze and mist in the valleys of the Valles Marineris. 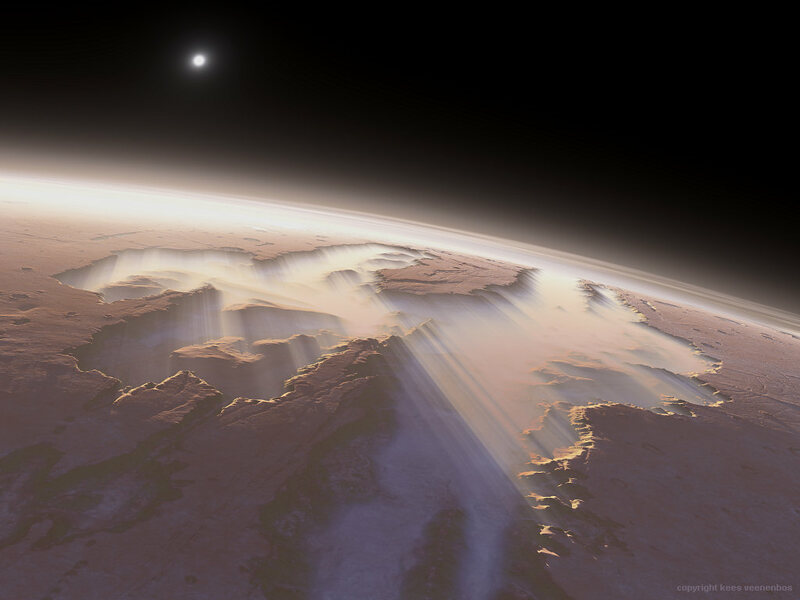 A concept for NGM with the Gusev Crater in the processing of evaporating water. A view to the south-east with the outlet Ma'adim Vallis at the right. 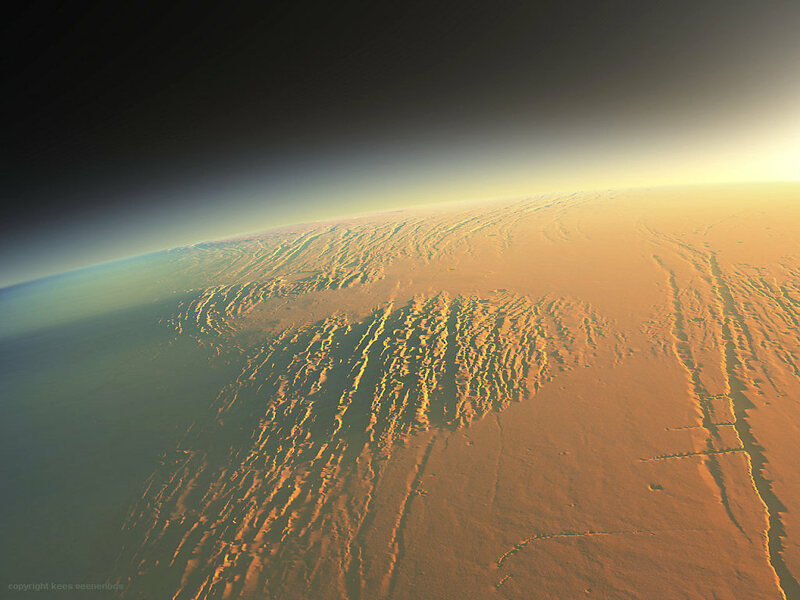 Ius Chasma (western valley in the Valles Marineris) with dusty atmosphere and mist in the lower parts of the valley. 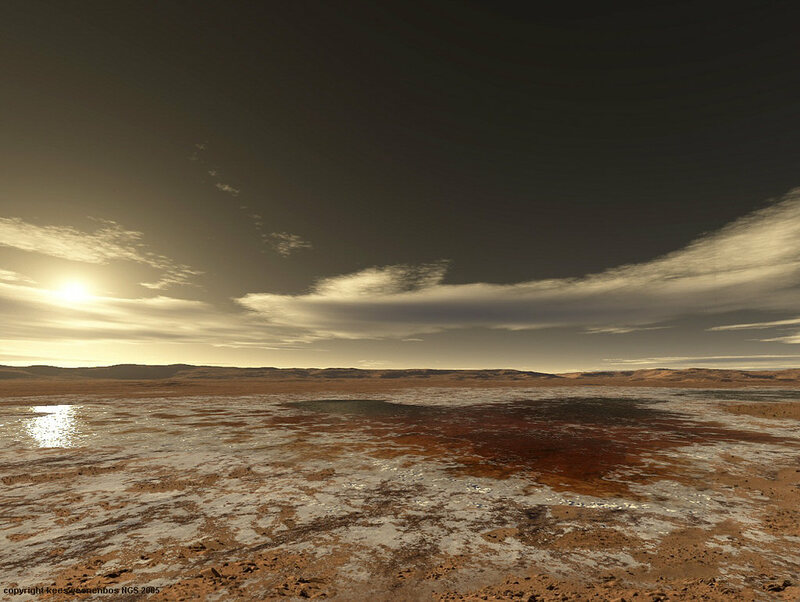 Visualisation of the Gusev Crater during the process of disappearing lakes. 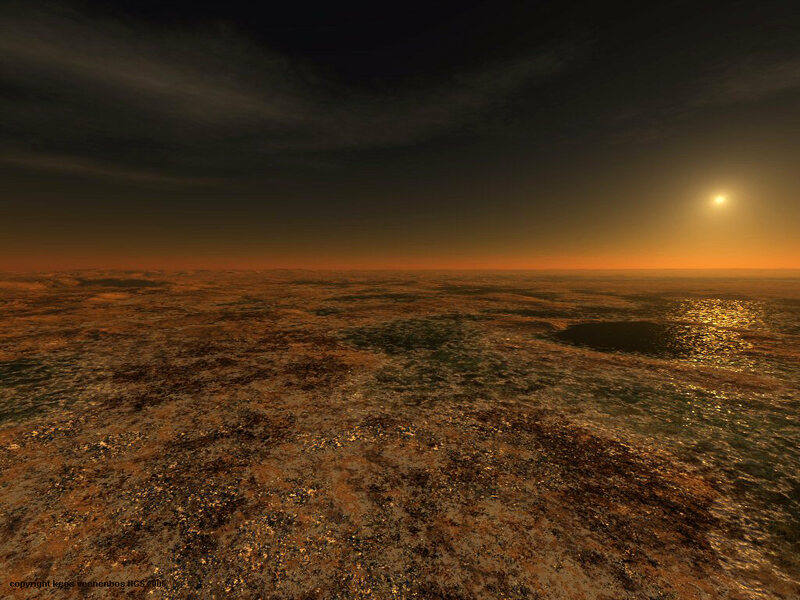 A possible view of Mars some billion years ago. About the same view as above. Oblique view form Ius Chasma (below) to Ophir and Candor Chasma (left) and right Melas and and at the top the Coprates Chasma. Another concept for National Geographic. Standing body of water in the Aram Chaos. Latest findings give prove of hematite in the lower parts of the Aram Chaos. 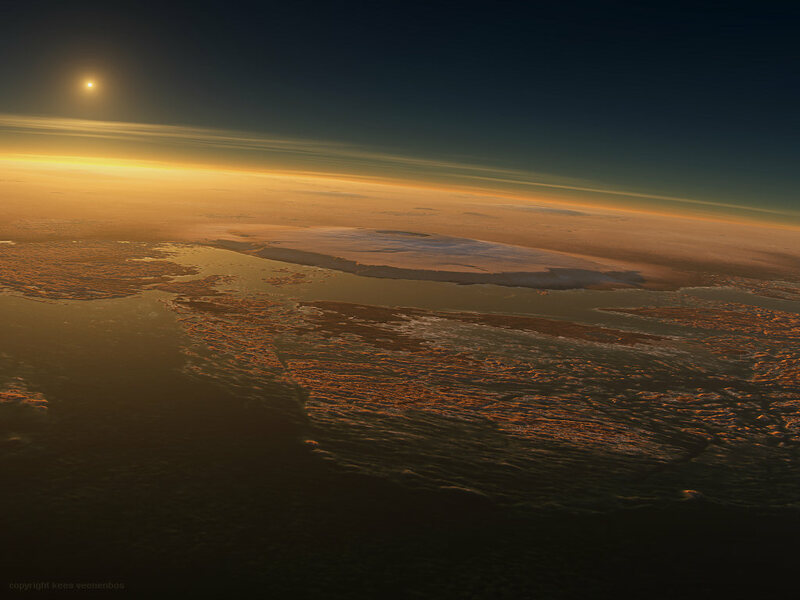 Concept for National Geographic: Mars during the period of loosing it's water some billion years ago. 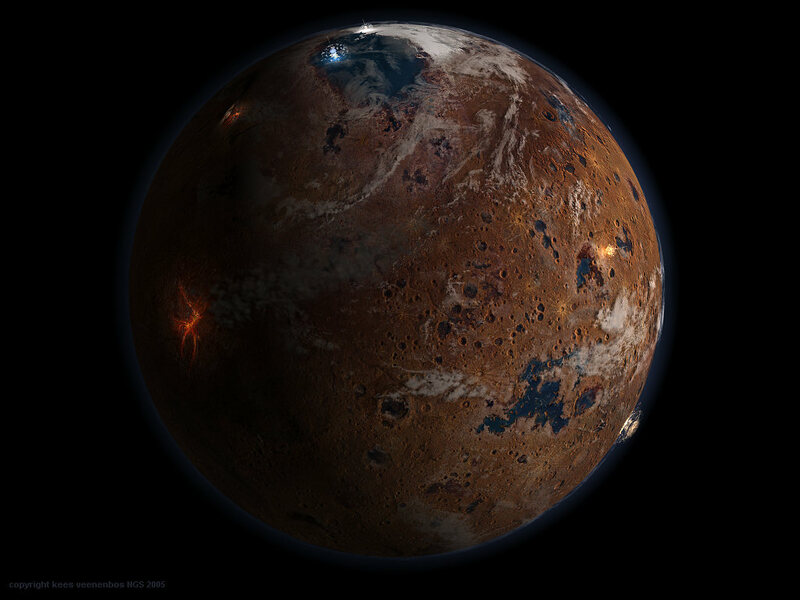 Salty deposits, cracks in the mud, forming of hematite, dust devils and falling meteors.